We love Mexican food so we are pretty picky since we try it everywhere we go. 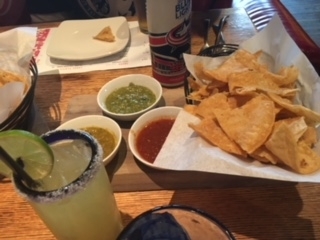 We just visited Columbus for a Blue Jackets hockey game and had the best experience at Nada, a new Mexican restaurant right in the Arena District. Of course I enjoyed a refreshing margarita (or two). We tried the freshly made guacamole and it was the best I have ever had! Everything is made fresh right there at the restaurant with the best ingredients. The service was amazing and the location is right in the arena district. There was a fun atmosphere and a lot of events going on around town. The sauces were out of this world! 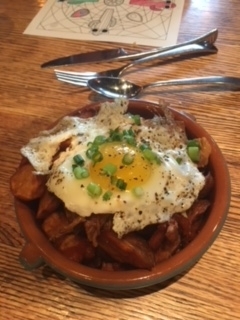 And we really enjoyed the Mexican Poutine, which is crispy red potatoes, fried egg, braised pork, black salsa, poblano cheese sauce and scallions. This was the most unique and amazing appetizer! Everything on the menu we had was incredible and we loved the tacos for dinner. Our daughter enjoyed her cheese quesadilla! Be sure to visit Nada the next time you are planning an evening out in the Arena District!